The big guy is always so jolly. 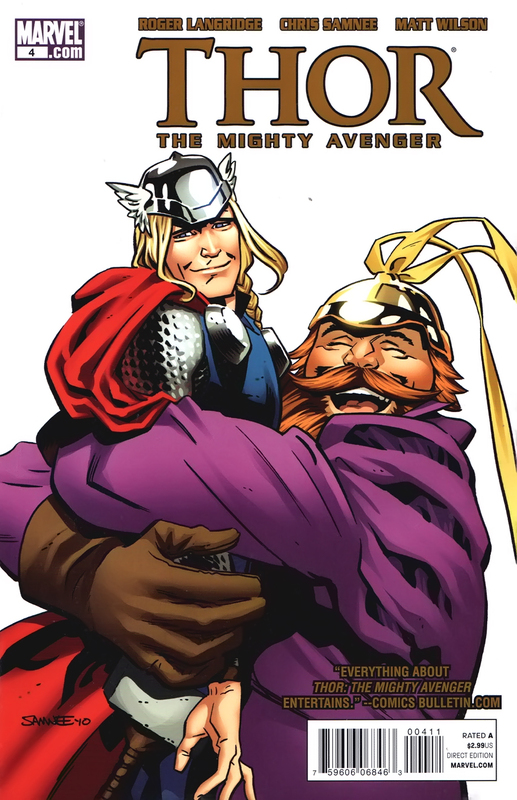 The Thor "Boys' Night Out" issue is fantastic. Men drink. Men fight. Men have a good time. Stories like this sometimes make me wish I was more simple minded because the seemingly fun situations that Thor and the warriors three get into never happen to me. Sure I drink with pals, but I never get into a fight and then later drink with the person I just fought. Plus, I haven't been in a fight since middle school. What educated person still fights? Anyway, there is something to be said for the male longing to be more primal and less...well, nerdy. Sorry just had to throw that in so I don't seem like a complete nerd (says the person with a blog who writes about a comic book a day). Back to the comic of the day at hand...Thor's group has the perfect hangout ratio for a story. Thor the Mighty Avenger #4 includes Thor's buddies who fit all the classic group stereotypes: Thor is the all-around athletic cool/nice guy, there's a big fat guy, there's the ladies man, and there's a friend of a different race. The group of guys is straight out of a 90's high school movie...and I love it. Something about the simplicity of the group, the simplicity of Thor's and Jane relationship and the simplicity of the art (by Chris Samnee...who puts together the 8 issue run of his life...so far) makes Thor the Mighty Avenger #4 one of the all time best single buddy issues that I can remember. Oh, and the fact that I can't remember a straight-up buddy issue means all the past ones were forgettable and not well done.